Many buildings on the west side of MIT’s campus, including Random Hall, Delta Kappa Epsilon, Alpha Tau Omega, and the W92 data center, lost power Wednesday night after what onlookers called a “manhole explosion.” As a result of the power outage, MIT’s e-mail, Web, and file services were inaccessible for much of Thursday morning. The explosion, caused by a short circuit in a submerged underground power cable, left a manhole cover between Westgate and W92 smoking and knocked out three electrical circuits, said one of the NSTAR technicians working on the line. Following the failure, a power line under Vassar St. failed at 11:10 p.m. Wednesday night, and street and traffic lights along Massachusetts Avenue went dark. Buildings served by MIT’s power plant were unaffected. However, the outage affected many on-campus buildings which receive power from NSTAR. Among the MIT buildings affected were Random Hall, DKE, ATO, N42, N57, NW62, W11, W59, W92, and WW15, according to the 3DOWN outage announcement service at http://is3down.mit.edu/. “Everything from here [Aubrey St.] to Brookline St. and from here to the river is out,” said passerby Eric Schanberger. Power was restored to buildings one by one after midnight as NSTAR technicians switched the buildings over to alternate power lines; some buildings in Central Square did not receive power until early morning. Services provided by the W92 data center, such as Web, AFS, and e-mail, were accessible during the outage because the building has a backup generator. But the building’s power supply failed to properly transition from its generator back to NSTAR power, said MIT Network Manager Jeffrey I. Schiller ’79. The resulting failure rendered many Internet services unavailable for several hours. Web sites hosted in Athena directories were inaccessible, as were Athena dialup servers, along with other related services such as stuff.mit.edu and the whereis.mit.edu map. The deadline for undergraduate early admission applications was midnight Wednesday evening, but no applicants appeared to be affected by the outage, according to the Admissions Office. Most users’ home directories were restored quickly, but 2730 of the user home directories stored on the AFS server lethe were unavailable on Thursday, said Camilla R. Fox ’00, a system administrator for Information Services & Technology. 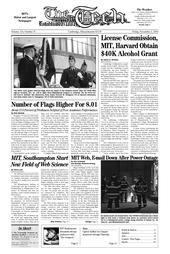 Because W92 contains three of MIT’s six Barracuda spam filters, some e-mail sent to MIT addresses Thursday morning during the outage was delayed and continued to be delivered late throughout the day. Though most of the services provided by the W92 data center were up by Thursday night, Schiller said the facility was still being powered by its diesel generator and uninterruptible power supply. IS&T will try to restore W92 to main power Friday morning, Schiller said. However, this operation is not risk-free and may cause an additional outage. If this switchover fails, the uninterruptible power supply will most likely be the cause. “In the end, we don’t really one hundred percent know what will happen,” he said. Though the power outage rendered many traffic lights and most of Cambridge dark during the outage, there were no accidents.